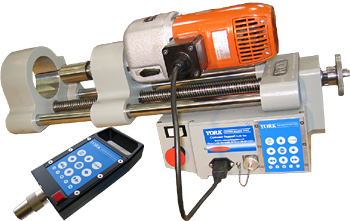 York Machine Shop brings portable equipment to the job site and reduces your heavy equipment downtime. Our machinists do on site machining using our own portable Line Boring and Milling machines that were designed and built at York. We come right to your work site and make precision repairs quickly and accurately. Whether it’s a re machined surface for an excavator rotek bearing, ( slewing ring ) or a pivot pin on a boom needing line boring, our experienced machinists will perform precision repairs and get you up and running faster. Our field services often perform bore welding, line boring, rotary milling, and in line turning in mining, forestry, and ship building industries. Small or large repairs, our experienced machinists will exceed your expectations. York is committed to providing quality service for its customers and seeks innovative solutions to the challenges of today’s industry.